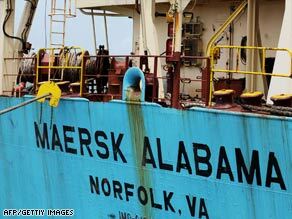 An e-mail from one of the crewmen aboard the Maersk Alabama tells a gripping tale of sailors fighting back against pirates who had taken over their ship. Crew heads back to U.S.
Fisher also said he was “pretty confident” that his captain would come out of the ordeal “OK.” Watch Capt. Phillips arrive in Kenya » “They have to know that if they kill him they’ll be done,” he said.